This is one of the many late 1970s-early 1980s knock-offs to come in the wake of Star Wars' juggernaut of success. It may be hard to tell but this figure has what closely resembles the head of a Stormtrooper. There's also no denying the similarities between the Space Fighters logo and that of the original "pyramid style" Star Wars logo. This figure was made by the Imperial Toy Corporation of California and Ontario. 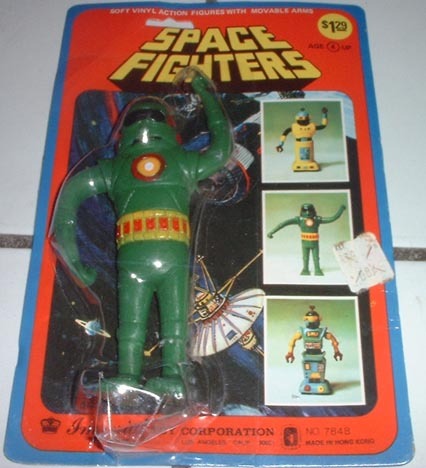 This company is also known for putting out a series of 1997 knock-offs called "Wall Traveling Star Fighters". They were basically small ships that looked very close to Star Wars ships that had a sticky wheel on the underside allowing them to slide down a wall. It would appear that 20 years earlier they were trying just as hard. Knock-offs are one the funnest aspects of the bootleg world. It's a real thrill seeing just how outlandish a company will get just to imitate a franchise like Star Wars without actually infringing.